Don Morrison is a retired forester and hobby farmer. He decided to use his knowledge of forest waste products and pasture management to evaluate the feasibility of locally produced biochar on a small scale. 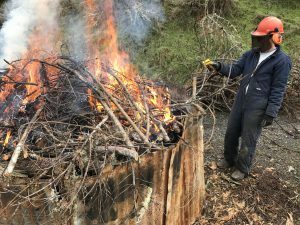 To do this, he began producing his own biochar using slash from the forest around his property, and evaluated it in both greenhouse and field trials. In addition to utilizing a waste material found in abundance nearby, he recognized the benefit to soil health with biochar application. He hopes that this knowledge can one day be scaled up to commercial production systems. As a retired forester, Don Morrison knows the challenges of managing large acres of forested lands. As part of regular forest plantation management, trees are thinned regularly. The logs are used for profitable uses and the rest—known as forest slash—is burned. Slash is mostly comprised of tree tops and limbs that are less than 4 inches in diameter. Don realized that producing biochar from this forest slash could serve two purposes: improve soil health and reuse forest waste. Don makes his biochar out of forest slash from a mixed forest—Douglas fir, incense cedar, pondera pine, and madrone. Conifer limbs piled for charring (Photo: Don Morrison). Don quickly realized that the key to producing biochar from forest slash is to minimize the number of times you have to pick up the feedstock. Although only the smaller pieces from timber operations are used, it still takes a lot of labor, and money, to pick up and move piles of slash. This economic consideration is important because reducing handling makes it more likely for commercial producers to adopt the practice. Don’s goal is to set up an operation by which he only has to move the feedstock twice: once when he puts it in the initial pile after cutting, and once when he throws it in the kiln. It is important to have enough space to build the pile. Since he is currently producing on a small scale, and as a testament to his commitment to biochar, he is cutting all of the wood by hand using his chainsaw. On an industrial scale this would be done with a machine and would be even more efficient. Don has built several mobile kilns in order to minimize the movement of the feedstock. 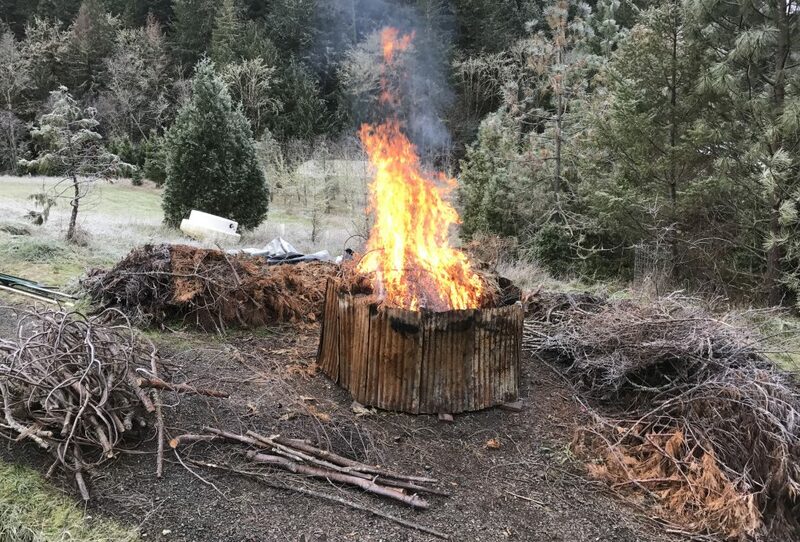 The idea is that you can build a slash pile, kiln it, and pull the biochar away, all in close proximity to the place where the tree was initially standing. Since his kilns are mobile, he can move them around the forest in the back of his pickup truck. Don estimates that he can produce between 1-3 yards of biochar in 3 hours. There is an art to biochar production and the production time can vary based on feedstock moisture content, as well as how the fire is monitored. 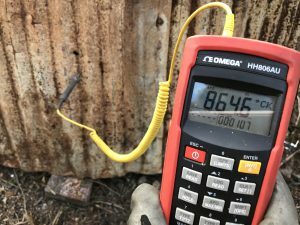 Don takes care to monitor the burn temperature as well as flame lengths, and he has observed that the hotter the temperature, the lower the final volume of biochar produced. 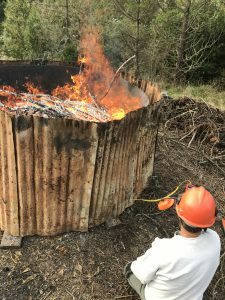 Don initially evaluated biochar with other members of the of the Umpqua Biochar Education Team (UBET) and scientists from the USDA Agricultural Research Service in Corvallis, Oregon. 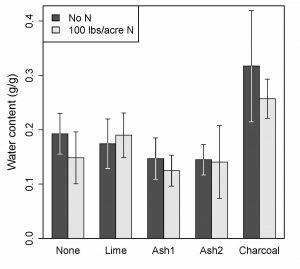 Some ranchers in in the area have been using a high carbon (40%-50% C) boiler ash as a lime substitute to amend highly leached acidic (sometimes with pH<5) pasture soils. The heavy ash biochar is available at no cost from various types of wood-fired boilers at local sawmills. 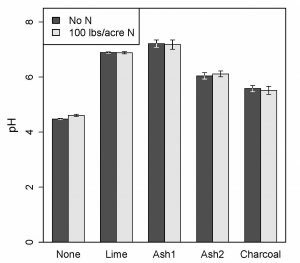 This preliminary greenhouse trial evaluated two types of high ash biochar (Ash1 and Ash2), lime, and Don’s homemade madrone wood biochar (Charcoal)—which has a lower ash content but is higher in stable carbon. In addition, nitrogen was applied to one set of treatments at rate of 100 lbs/acre. An individual rye grass plant was grown in a pot for six weeks and then harvested for analysis. Treatments were also evaluated for their impact on soil water, nutrients, and pH. 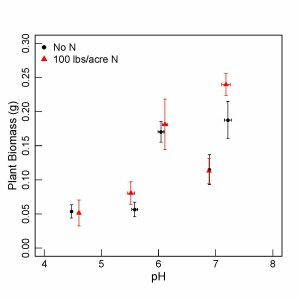 This experiment found that biochar application increased plant growth, but mostly by increasing soil pH. Plant biomass was generally higher as pH increased. All of the treatments raised pH when compared to the control. In addition, the madrone biochar also increased soil water content, and one of the high ash biochars (Ash 1) increased concentrations of exchangeable phosphorous and potassium. What does this mean? These results suggest that for this soil, acidity is a primary growth-limiting factor. While biochar can impact various soil properties, the liming affect for acidic soils may have the biggest impact on plant growth. 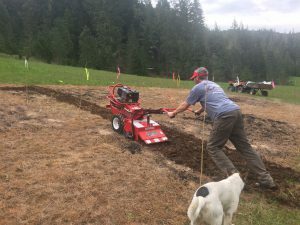 Applying biochar to mitigate pH issues is a good option for ranchers west of the Cascades, especially if the biochar is lower in cost and more easily available than lime. Another lesson learned in this experiment is that it is important to know your biochar. If you want to raise the pH of your soil, applying a biochar that has a higher ash content will raise the pH more than a biochar with lower ash content. However, if you want to increase soil water content, applying a low ash biochar may have a greater impact. Not all biochars are the same, and using the biochar that best meets your soil needs will lead to desired results. If you decide to make your own biochar, it is a good idea to get it tested in a lab so that you know what the properties of it are before you apply it to your farm or garden. If not, you may be disappointed with the results. Plant growth increased with biochar amendment, and seemed mostly related to increased soil pH. The high-carbon boiler ashes had more liming effect than Don’s biochar (charcoal). However, Don’s biochar had better water retention than the boiler ashes. Don is in the process of conducting field trials to replicate the pot experiment on a larger scale. He has a small farm and has been haying his fields for years—resulting in soil nutrient depletion. 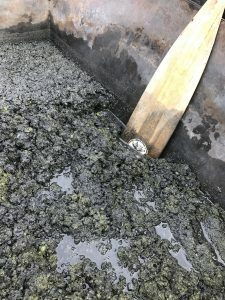 To produce enough soil amendment for a field application, he has incorporated the biochar into his compost pile and has “charged” it by mixing it with alfalfa pellets, worm castings, wood vinegar, and molasses. This process may encourage microbial activity and add moisture to the field. For this experiment, he seeded a combination of common pasture plants including annual rye grass, clover, and plantain. Although he is growing these for are wildlife, the results can be transferred to a commercial pasture production system. To simulate this, he rototilled the soil, added the biochar, and then planted with a hand-held seed hopper (a machine that scatters the seed in the field). To evaluate the effect of biochar on plant growth, Don plans to mow the plots in July with his lawn mower, collect the mowed material, dry it, and weigh it. The comparison of dry plant material will enable him to quantify the value of biochar application to a rancher. At this point he does not plan to do a nutrient analysis on the plant material, but he designed his experiment in a way that keeps the door open for future research. Since Don is still collecting data, he knows he will continue to learn lessons about biochar in the coming years. However, he has realized that it takes time to figure out the most efficient way to put together a new system. From the handling of feedstock, to the optimum levels of application and evaluation of the cost of production and application, collecting data that can lead to a recommendation for ranchers can be challenging. However, citizen science can play an important first step with a novel product like biochar! Don’t be afraid to experiment!